The floor fireplaces are an innovative and stylish alternative to the traditional fireplaces with flue. Among the proposed models, you can find on our catalogue modern and functional design fireplaces. You will certainly find the product you are looking for: some fireplaces are simple and elegant; others have special shapes and a contemporary style. It will not be difficult for you find the suitable floor fireplace for your furniture, both if you prefer a classic or a contemporary style. Infabbrica pays particular attention to bioethanol floor fireplaces, which protect the environment and your health. In fact, they don’t release toxic fumes as carbon monoxide, while carbon dioxide is necessarily issued during the combustion, but in smaller doses than other fireplaces. 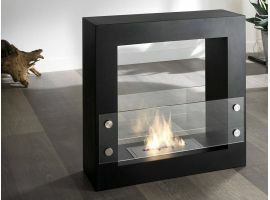 A floor fireplace is not just a design item, which makes unique your furniture, it is first a pleasure to live: a fireplace is ideal to warm the room between seasons and it is a help to the traditional heating during the coldest winter days. The flames warm you outside and inside after a long day, so that once at home you don’t want going out any more! What’s the social life compared to a warm relaxing and enjoyable evening spent on sofa watching a good film? Floor fireplaces are a piece of furniture of great impact: their presence can improve the success of the whole room's furniture. Both leaning at the wall or in the centre of the room, the floor fireplace catches the eyes of your guests, regardless of the natural instinct oh humans to be captured by flames! In fact, even when turned off the fireplace is a central element of your furniture thanks to its innovative and fashionable design. 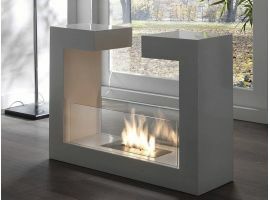 On the online catalogue of Infabbrica there are many models of floor fireplaces. 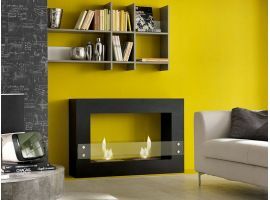 Depending on your taste, you can choose among our simple and elegant fireplaces, with metal base and cover in tempered glass, fireplaces with a minimalist and contemporary style, in varnished white or black metal, and finally among fireplaces with a particular shape, as triangular or round. These items have visible flames as the traditional fireplaces. The fireplaces offered from Infabbrica are not only decorative: they are realized with innovative technologies, which allow warming the house in a short time. The size of space and fireplace, especially the dimension of burner, affect the fireplace potentialities. On average a floor fireplace with a 1,5 L burner can enhance the temperature of a 35 square meters room of 5 degrees in a couple of hours. It is obviously a totally indicative figure. A floor fireplace gives your room warmth: it warms physically your home and gives a touch of style, which cuddles your guests in a familiar and welcoming place! 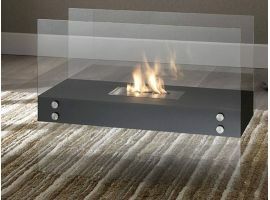 Infabbrica pays particular attention to bioethanol floor fireplaces, which are an eco-friendly and design alternative to traditional fireplaces. These fireplaces are able to enhance the temperature of a medium-size room of 5 or 6 degrees in short time, depending on the capacity of the burner. The combustion starts burning a special eco-friendly and renewable fuel, the bioethanol, a biological ethyl alcohol. This fuel is extracted from sugary food scraps like marc, cereals, beets and corn. Burning the bioethanol doesn’t produce toxic wastes (as carbon monoxide) for human beings and environment, excepting carbon dioxide but in lesser amount than other fireplaces. Bioethanol floor fireplaces are easy to install (just a few uncomplicated steps) and are less demanding than traditional fireplaces. Therefore, they are the perfect alternative for houses without flue or apartments for rent, where many internal changes are not allowed. 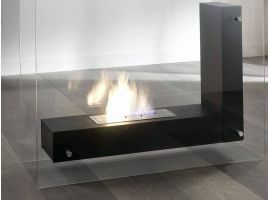 Moreover, the bioethanol floor fireplaces are not prohibitive: cost varies from model to model and some of these are exceptionally affordable. There are not maintenance costs and bioethanol is a cheap fuel that burns slowly away. In addition to functionality, these floor fireplaces have another great quality: numerous design models are available, which allow us to express totally our creativity, respecting our aesthetic taste and the style of house’s furniture. Design of bioethanol fireplaces is innovative also in the classic versions and it gives the room an incredible touch of style and elegance. 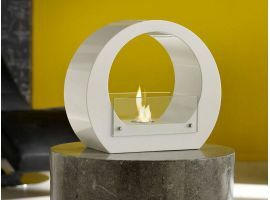 However, practically, how do bioethanol fireplaces work? It’s easy to say! The bioethanol is inserted in the tank, which contains a porous stone that has the capacity to absorb ethyl alcohol and release it in the form of steam. Subsequently the steam passes into the burner in stainless steel. In this way, fuel and flame remain separated, making the bioethanol fireplaces highly safe. Floor fireplaces: choose the suitable fireplace to your needs! If you have questions or doubts, call us at +39 0721 580999 or write to info@infabbrica.com: if you need further information about the floor fireplace you decided buying, if you need clarifications about payment or delivery timing… The aim of Infabbrica is not only providing high quality and design products at factory prices, we desire to drive our customers with competence and professionalism and assist directly them for each need. A satisfied customer is our greatest satisfaction!